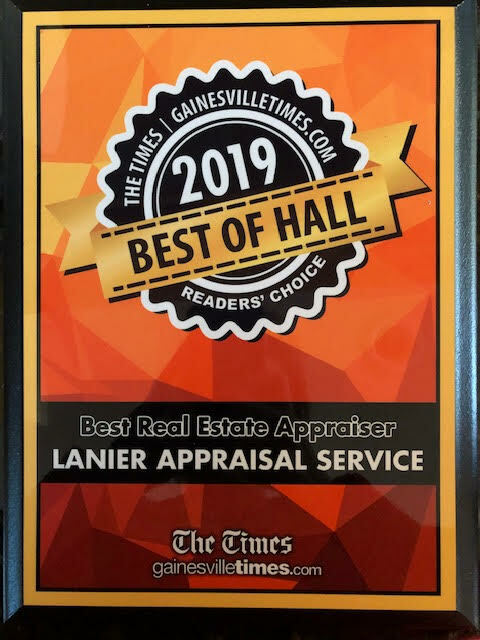 Lanier Appraisal Service Home Page. Lake Lanier Appraiser, Pre-Listing Appraisals, Tax Appeal Appraiser, Estate Planning Appraisals, Date of Death Appraisals, Hall County, GA Appraiser. WONDERING IF THE TAX DEPT HAS THE CORRECT SQUARE FOOTAGE ON YOUR HOME? GOOD CHANCE IT DOES NOT and that directly impacts VALUE for your home! We offer a sketching service which will provide you and your Realtor with valuable and correct square footage for all levels of your home. Lanier Appraisal Service has 25 years of appraisal experience in this area and on the Lake. If you are looking for a Lake Lanier Appraiser, you have come to the right place. We also specialize in Pre-Listing and Pre-Sale Appraisals for ALL Single Family Homes on or off the Lake. Make sure you price your home IN the market, not just ON the market and get an appraisal before you put that sign in your yard. For Cash Buyers, protect your investment and get an appraisal, then make the contract contingent upon getting your own appraisal. Do you want to keep up with current Appraisal Issues....Click Button Below. Safe Emails you can trust! Mary Thompson of Lanier Appraisal Service was recently interviewed by Channel 2 Action News as the Lake Expert to discuss how low water levels impact Real Estate Values and Sales Activity on the Lake. Mary was also interviewed by The Gainesville Times on the same topic and The Weather Channel. We also conduct Relocation, Estate Planning & Tax Appeal Appraisals, plus ALL Single Family Home Appraisals. Mary Thompson named as one of The Top 10 Appraiser Power Bloggers Nationwide. Lake Lanier, Private Party Appraisals (Pre-Listing & Sale Appraisals). We work with Buyers and Sellers regularly who order their own appraisals for peace of mind before placing their home on the market or before placing an offer on a home. Pre-Listing or Listing Appraisals are worth their weight in Gold and should be included as part of the Home Selling Preparation Process. A Pre-Listing Appraisal is just as important as updating your home with new paint, carpet, appliances, etc. before you put it on the market. The best money you can spend is for a pre-listing appraisal as you can use it for setting a realistic listing price, negotiations when an offer comes in and it can also be given to the bank Appraiser when they come calling. 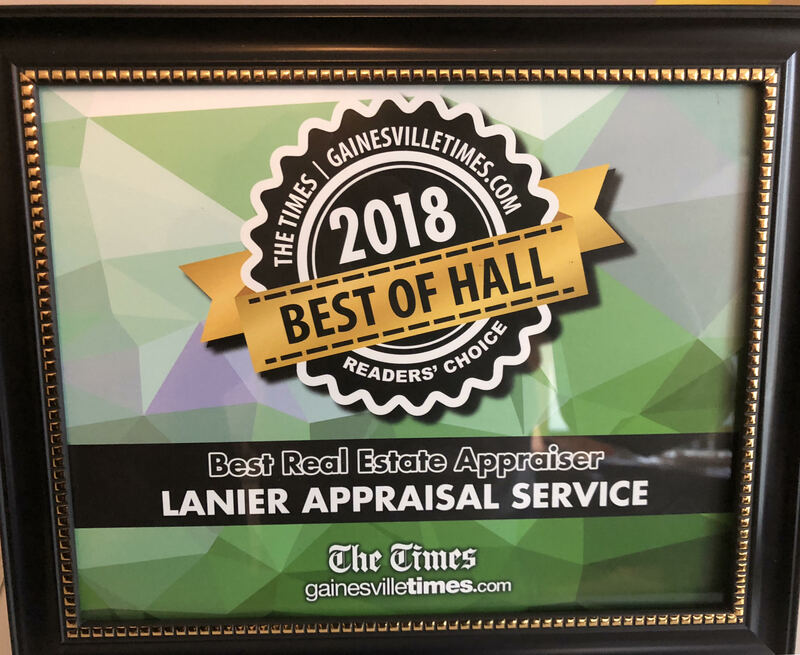 Lanier Appraisal Service is Number 1 Real Estate Appraiser in the State of Georgia on Active Rain. www.activerain.com Number 2 Female Appraiser in the Entire Country. Almost 2,500 Appraisers have a blog on Active Rain and almost 165,000 Realtors have blogs on this very large Real Estate Related Blogging Website. "Mary is well known by many of the top Lake Lanier Realtors and they can tell you that Mary knows the Lake!" Teresa Smith, Arthur Prescott, Kim Waters, Sheila Davis, Patsy Bailey, Norman Moolenaar to name a few.